Where do I fill up? 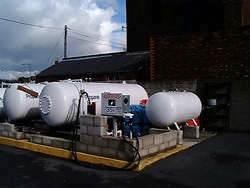 The main difference between Autogas and a standard petrol pump is that the cylinders are kept above ground. 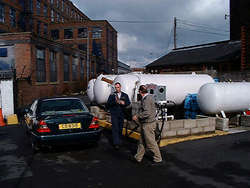 Other than this difference, filling up with Autogas is pretty much the same as for petrol. An attendant will fill up your tank for you. 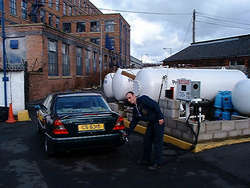 Tell the attendant how much Autogas you want, and be amazed at how little it costs per litre. 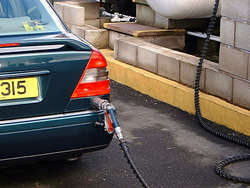 The attendant then fills your tank, which takes only a little longer than when filling up with petrol and is quite a bit noisier. As you can see, the nozzle is virtually identical to a petrol nozzle. The only difference is that the connection is sealed to ensure no leakage. When you’ve finished, drive away with a smile on your face – filling up has cost you less than half the price of petrol.